Social learning is a widespread phenomenon across many taxa (Hoppitt & Laland 2013) and signifies “learning that is facilitated by observation of, or interaction with, another individual” (Heyes 1994). Social transmission, the cognitively most demanding form of social learning, occurs when information is transferred from one animal to another, either through passive information transfer or active tutoring (Galef 1975, Hoppitt & Laland 2013). In bats, social transmission can facilitate different cognitive processes, namely the acquirement of vocal skills (e.g. Boughman 1998, Knörnschild et al. 2010, Knörnschild et al. 2012) and novel foraging behavior (e.g. Ratcliffe & Hofstede 2005, Page & Ryan 2006, Wright et al. 2011, Clarin et al. 2014) or the localization of food sources (e.g. Wilkinson 1995, Wilkinson & Boughman 1999, Gillam et al. 2007). While frugivorous and animalivorous bats are known to use social information when foraging, nectarivorous bats (Glossophaginae) have not been studied to the same extent. Group of nectarivorous Glossophaga soricina roosting in a cave (© Stifter). 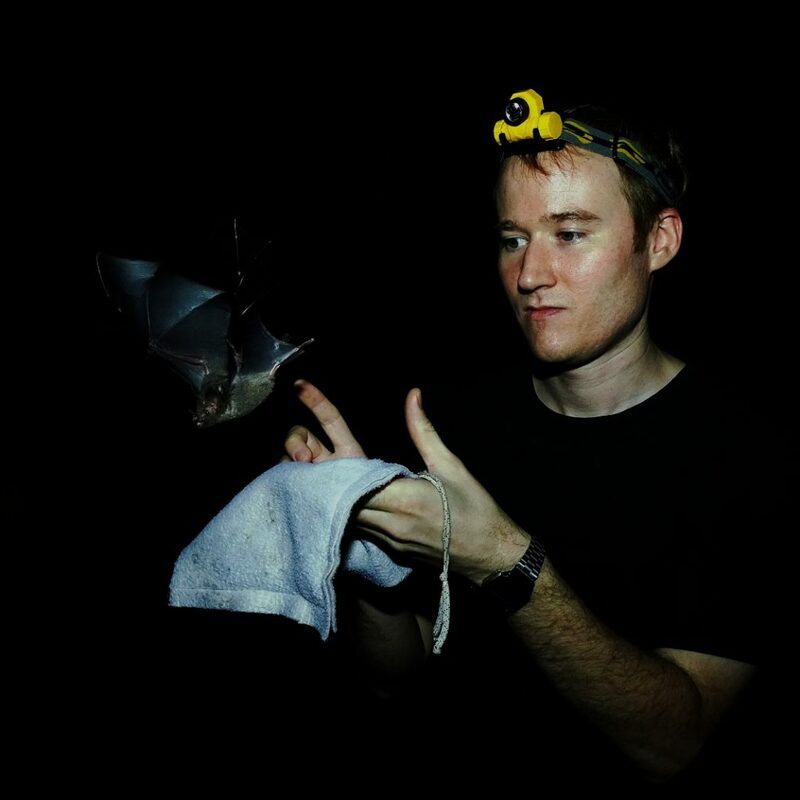 In his Ph.D. thesis, Andreas Rose investigates whether bats (Glossophaga soricina) can acquire foraging information such as flower types, flower positions or feeding techniques via social transmission from knowledgeable conspecifics. He already published a paper on social transmission of flower positions and on spatial memory capacity in captive Pallas’ long-tongued bats, Glossophaga soricina (Rose et al. 2015). Follow-up studies with free-livings bats are forthcoming. More detailled information about Andreas Rose’s research can be found on the website of the ACG, Área de Conservación Guanacaste in Costa Rica, where he conducts social learning experiments in the field. Andi releasing a bat (© Rose). 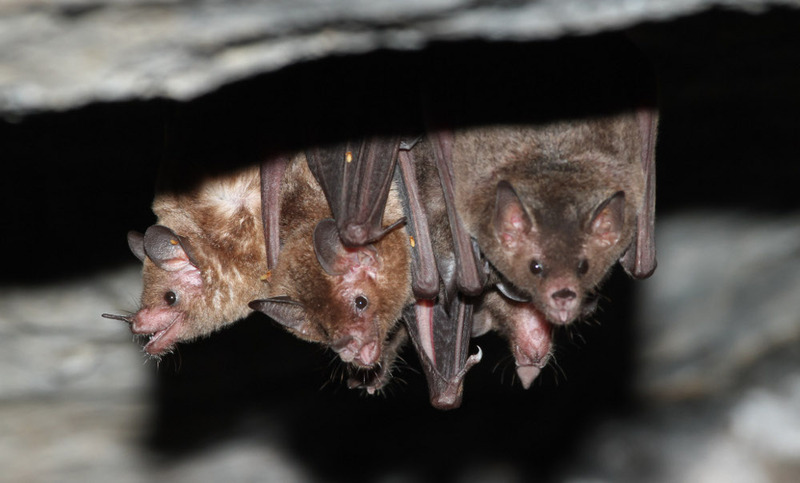 In bats, social transmission among conspecifics can occur horizontally (from adult to adult) or vertically (from mother to pup) but the latter form has received much less attention so far. Since Glossophaga soricina mothers regularly regurgitae nectar for their pups, this species is well suited to study vertical social transmission of foraging behavior (e.g. dietary preferences). G. soricina mother feeds nectar to her pup (© Rose).